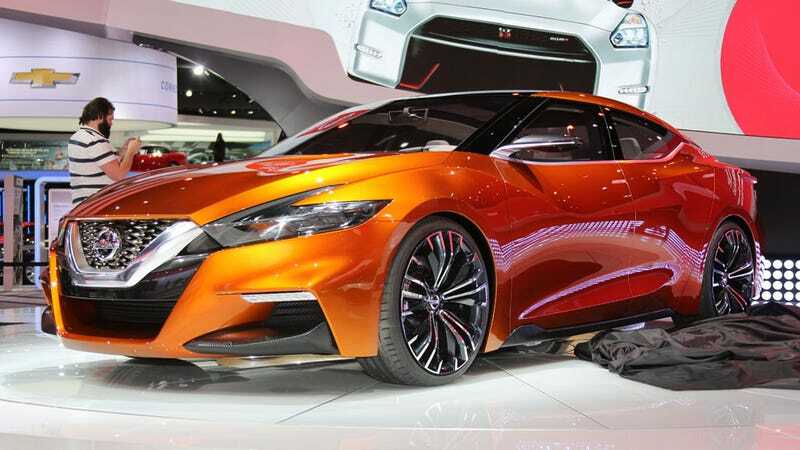 Thanks to some eavesdropping, we've got the very first full images of Nissan's new Sport Sedan Concept, and it's pretty striking. We've seen it teased in artfully-frustrating low-light shots before, but this is the first full reveal. And it's so very orange. This is likely to hint at the design direction for a hypothetical upcoming Maxima, and there's a number of compelling design details going on here. The C-pillar has a novel looking little break that separates the roof from the lower body, there's some dramatically shaped front wheel arches, and an interesting use of multiple creases and intaglio areas on the side. The B-pillar seems to be blacked out and glassed-over, but I think hoping for a pillarless sedan may be too much. Up front is a little busy with the integration of Nissan's corporate horseshoe/square boomerang grille, and it's likely the car would be cleaner without it. Still, overall, the proportions look great, and I'm excited to inspect this thing more when they really take the cover off.